The 6th of December is celebrated as St. Nicholas Day in many parts of German-speaking Europe. The real Saint Nicholas is the patron saint of children, sailors, students, teachers, and merchants. Since he delivers gifts to children on his feast day, Dec. 6, the saint is often confused with Santa Claus, who came about much later. While Nicholas doesn’t use reindeer, he does travel with a companion known by different names. Be warned that this is no jolly elf. One alias, Krampus, actually enjoys scaring the children! So how did we get from St. Nicholas to Santa Claus? Thank Martin Luther, who, in his effort to give Protestants their own Christmas traditions, introduced an angel-like Christ Child (Christkindl) who brought gifts. This religious figure was later replaced by der Weihnachtsmann (Father Christmas) a.k.a. Santa Claus. Whether you’re shopping for St. Nicholas Day or Christmas, check out these gifts for those attending the International German Genealogy Conference in Sacramento next June. You could wrap up a tour of San Francisco, the Wine/Gold Country or Lake Tahoe for the non-family researcher accompanying you to the conference. Or, if you’ve been extra good in doing your research, treat yourself to one (or more) of the free Genealogical and Historic Walking tours in downtown Sacramento. 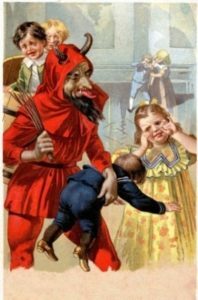 Krampus with the children. Postcard circa 1920. REGISTER NOW. Take advantage now of the early bird registration rates, which end Jan. 15. With limited seating available, it’s best not to hesitate. If the conference is full, your registration will go on a wait list. BOOK A ROOM. The conference hotel, The Hyatt Regency, now has limited availability. But you can get a conference rate at the Marriott Residence Inn, just two blocks from the conference hotel. This entry was posted in 2019 Seminars and Conferences, Out-of-Area News and tagged International German Genealogy.